The extreme folly of making predictions about what will happen due to the Fed’s unprecedented interference in free markets can be summarized neatly; nobody knows because in all of recorded history there has never been a period of time when money has been available for nearly free for this long. It is perhaps the most unnatural economic state: Borrowers, many resoundingly unfit to borrow and with almost no chance of ever repaying their debt, are allowed to borrow as much as they want at near-zero interest rates. It runs contrary to every sound mathematical and economic principle there is. It devalues risk to a staggering extreme. It is out-and-out life support for enterprise and commerce that the free market would have ended quickly and unceremoniously. There is no such thing as an economic free lunch. There are consequences to enabling the worst employers of capital access to nearly limitless capital at nearly no cost, year after year. This is capitalism. In order it to thrive and prosper, everybody doesn’t get to win. ZIRP might be more accurately be referred to as corporate socialism, where the weakest and least able are rewarded in equal measure to the strongest and most productive. For lo eight years, the Federal Reserve has waged a ceaseless warfare upon interest rates. Economic law, history, logic itself, stagger under the onslaughts. We suspect that economic reality will one day prevail. This fear haunts our days… and poisons our nights. Were interest rates 122 years ago the lowest in world history? 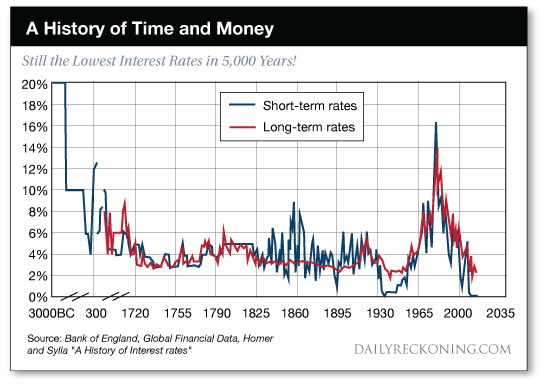 And are low interest rates the historical norm… rather than the exception? Please direct your attention to anno Domini 1895. Rates had never been lower in all of history. They would only sink lower on two subsequent occasions — the dark, depressed days of the early 1930s — and the present day, dark and depressed in its own right.